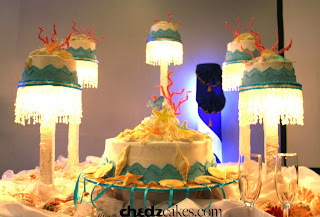 Summer might be over, but when I met with the couple for this cake, they already had the theme in mind: Under the Sea! So I came up with this design. 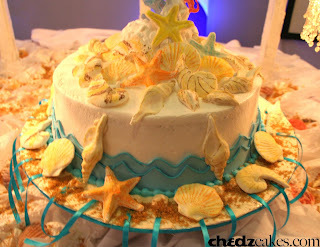 We used edible seashells, corals and blue "waves" (made of gumpaste) for the cake. The sea shells were painted in assorted pastel colors. We added in lighted crystal beads. Then the two dolphin figurines were used instead of the usual bride&groom figurine. Five mini cakes surround the main cake in different flavors like mocha, choco chip, marble and strawberry. At the bottom of the set-up are real shells and sand to complete the "under the sea" look.